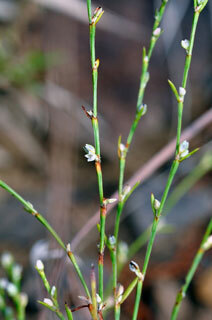 Stems: Erect, simple or branched, glabrous or slightly rough with minute pimple-like projections. Leaves: Cauline, alternate; ocrea 1/4 to 3/5 inch, lower part cylindric, upper part soon disintegrating into few brown fibers; petiole short; blade with 1 pleat on each side and parallel to midrib, green to grayish green, narrowly lanceolate to linear, 1 to 1.6 inch long, 1/25 to 1/3 inch wide, margins entire, tip mucronate or cuspidate. Inflorescences: Spike-like, cymes, axillary and terminal, 1-2(-3)-flowered. Flowers: Bisexual, closed; pedicels erect, 1/25 to 1/16 inch; perianth 1/10 to 1/6 inch; tube comprising 15 to 25% of perianth length; tepals 5, green with pink or white margins, elliptic; stamens 8. Fruits: Achenes black, elliptic to oblong, 1/10 to 1/6 inch, shiny, smooth or minutely striate-papillose near edges and apex; seed 1.